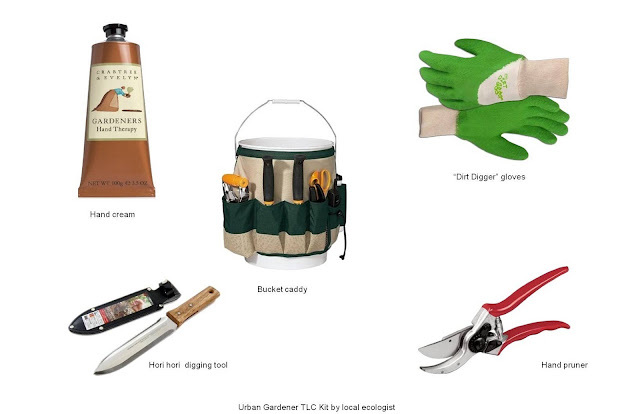 To appease my outdoor garden envy I created a TLC kit for the urban gardener. 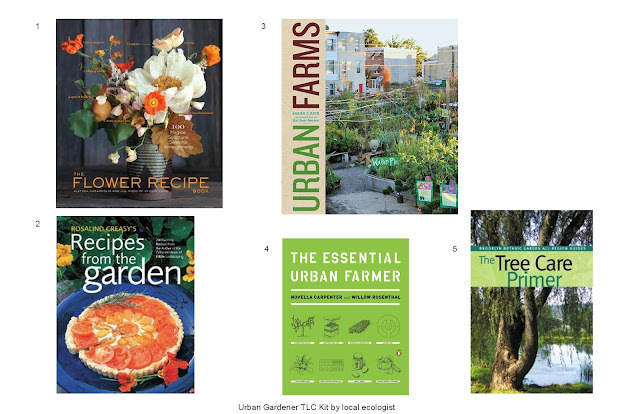 When I lived in Boston, I had a plot in the Victory Gardens in Fenway and grew edible and ornamental plants. I used the Felco hand pruner I acquired as a community forester in New Haven and soothed by chapped hands with Crabtree & Evelyn's Gardeners hand cream, a thoughtful gift from a friend. The first time I used a hori-hori was in Berkeley; I was weeding a trail-side before re-planting it with California natives. The Nisaku hori-hori digging tool shown above is one of several carried by Amazon. The handsome hori-hori sold by Canoe is currently out of stock. At the end of the final class of the Trees New York Citizen Pruner course I was presented with a big blue bucket. The bucket is perfect for carrying your tools (hand pruner, pole saw, tree saw heads, gloves) as well as the vegetation you pruned. The garden bucket caddy by Fiskar is an improvement as it keeps your tools separate and secure. Canoe carries a canvas garden tote by Eena but I prefer the carrying capacity of the bucket caddy. I do not recall the brand name of any garden gloves I have used but I think I may remember the "Dirt Digger" glove by Boss Gloves. Why? First Lady and gardener Michelle Obama wore a pair during a spring planting event in April. After you've weeded, planted, pruned, or simply admired, you can treat yourself to books and tea. London and Paris are known for their gardens (and trees). Why not prepare a cup of Harney & Sons Tower of London or Paris tea? If you have a garden plot or yard, you might consider reading The Flower Recipe by Alethea Harampolis and Jill Rizzo or the classic Recipes from the Garden by Rosalind Creasy. A couple of other inspiring options are Urban Farms by Sarah C. Rich and The Essential Urban Farmer by Novella Carpenter and Willow Rosenthal. For tree folks, whether the tree is in the sidewalk, in a park, or in your yard, there is The Tree Care Primer by Christopher Roddick. All tool images via Amazon.